ONE of the most interesting characters among the" Mediums" of the latter half of the Nineteenth Century was David Duguid. It will be for the convenience of both reader and writer, if we divide this Chapter into sections, and consider the subject of it from different points of view. I.-DAVID DUGUID AS A MAN. David Duguid was born at Dunfermline, in Scotland, on the 10th of February, 1832, He had no other education as a boy than what was then common among the working classes. He was brought up to the occupation of a working cabinet-maker. His only subsequent educational advantage was that in 1868 he went for four months to the Government School of Art in Glasgow. He thus presents a great contrast to several other Mediums, whose names are much better known. He never mixed in so-called "good Society," or was entertained at Courts, like D. D. Home. He was not a University Graduate, who became a clergyman of the Church of England, like W. Stainton-Moses. He did not attract crowds to his lectures in various countries of the world like J. J. Morse. He always lived in Glasgow, where for the last twenty years of his life he worked for a business firm until only a day before his death, on the 14th March, 1907, since a commencement was made in collecting the materials for this book. when he was fifteen, and was in demand as "the Boy Speaker." He was the first President of the Glasgow Spiritualists' Society, and Chairman of the Port Glasgow Total Abstinence Society. He had a high opinion of Mr. Duguid, in which he says he was joined by the Revs. Dr. Morrison, Dr. John Guthrie, Dr, John Kirk, of Edinburgh, and other well-known men of the day. A few words may be quoted from a graphic sketch of Mr. Duguid contained in a letter from Mr. James Robertson, of Glasgow, written shortly before Mr. Duguid's death. It was in his firm that Mr. Duguid worked during the last twenty years of his life. Mr. Robertson says:¬" Duguid is not very enthusiastic about anything, a dreamy silent man, unconscious pretty much of the value of his gifts. A bit care¬less whether anything be done or not.". These remarks are introduced here, following the precedent of Mr. F. W. H. Myers in his introduction to his descriptions of the W. Stainton Moses phenomena. It seemed important to Mr. Myers, in view of what was to follow, that the reader should be in possession of some account of Mr. Stainton Moses, his work and his friends. For over forty years Mr. Duguid's life as a faithful servant and a skilled artisan was intermixed with experiences of a vcry different character. Again paraphrasing Mr. Myers' introduc¬tion to the Stainton Moses phenomena, our narrativc will now pass from the ordinary and commonplace to the extraordinary and the almost incredible. II.-DAVID DUGUID AS A MEDIUM. producing a number of small sketches under the alleged combined influence of Ruisdal and Steen. In 1869, a new development took place. It was suggested that at the sittings, after the usual work on a large picture, the Medium should begin and finish a small card-painting 01' drawing in the presence of the circle. Prom this time, at most of the sittings, one or more small paintings were executed by the Medium, sometimes in full light, and sometimes with only just as much light as was necessary to enable the working Medium to be seen. Prom eight to twelve minutes were generally devoted to each picture, the Medium appearing to be in a trance all the time and unconscious of what he was doing or of the persons around him. More striking developments soon took place. One evening, during the usual conversation with the intelligence, before the Medium woke up, the circle was told that these small paintings and drawings could be done in less time if total darkness was ensured. This was complied with, and equally good pictures were produced in from one to three minutes. On one occasion, when five or six minutes were occupied, it was found that on one small card.3 and a half by 2 and a half inches, six pictures were produced, all well defined, and as close to each other as the squares on a draught-board. This was astonishing I But when shortly after, a small landscape was done in 35 seconds, the members of the circle expressed their belief that it was impossible it could have been executed by the Medium. "The controlling spirit" said they were quite right; and informed them that these little pictures were "the direct work of the Spirit painters," the Medium giving no mechanical aid. MI'. H. Nisbet states that on one occasion the Medium laid his hands in his, when the gas was turned off, while the picture was being painted. A considerable number of "direct" writings were also done under similar conditions. 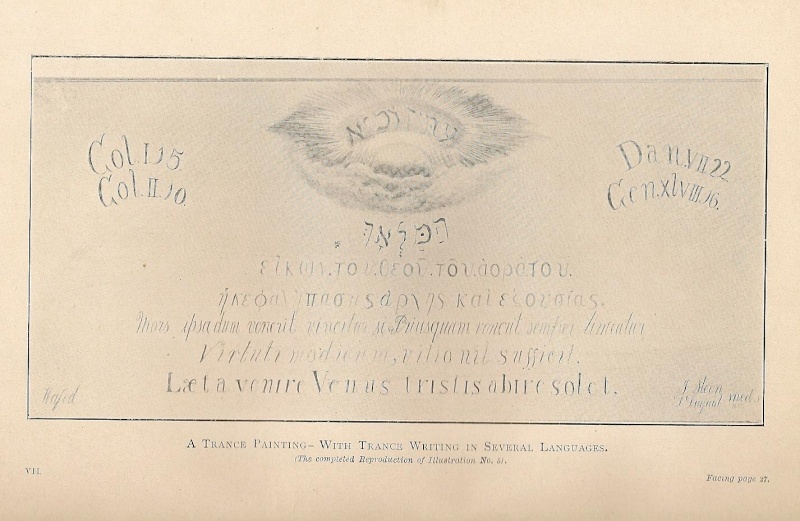 The writings were in several languages, even on the same card, Hebrew, Greek, Latin, English, and in one case German. Occasionally English translations of the foreign languages were also given. What appeared to be Egyptian figures and hieoroglyphics were also produced in the same way. The greater number of these small picture cards and drawings were given away to the visitors at the sittings. interference with their control. They had said that they would on no account allow their medium to be used by "other spirits." They had selected him as peculiarly adapted for painting in trance, and any deviation from this would have a prejudicial effect. Mr. Nisbet was therefore greatly surprised when an entirely new intelli¬gence began to speak through Mr. Duguid, in the trance-condition, as before, and not only so, but assumed control over the whole proceedings. This intelligence professed to be a Persian, of the name of " Hafed," who had lived on earth 1,900 years previously. /He had been, he said, a chief or prince of Persia, a warrior, after¬wards head of the Magi, and finally, in his old age, a preacher of the Christian faith, for his adherence to which he suffered martyrdom. " Ruisdal" and , "Steen," controlling Mr. Duguid, explained that so greatly was this Persian esteemed by them that they could not but comply with his request to use the medium for the purpose he desired. They were convinced that the end he had in view was that which they themselves were seeking to accomplish-namely, to lead mankind to a clearer apprehension of spiritual existence. Hitherto, during the sittings, conversation between the medium and those present had been carried on by "Ruisdal " and" Steen"; but it was evident they had not the same power over him in speaking as they possessed in painting. Under the control of "Hafed," however, the medium soon acquired greater facility of expression. Mr. Nisbet remarked that on his first introduction to the Persian, the effect on the derneanour of the entranced medium was very striking. He appeared awestruck, and bent forward, with hands clasped in the attitude of the deepest reverence. He then raised his head and saluted those present with the words: " My greeting unto you." On subsequent occasions, when under the same "control," the salutation was given in a similar manner. entranced medium, the" control" making corrections and emenda¬tions. Forty-six sittings held from the 29th of November, 1869, to the 20th of January, 1872, were devoted to a biography of Hafed's earth-life, Twenty-six sittings were then devoted to his subse¬quent experiences and to answers to questions. These were held from the 18th of July, 1872, to the 13th September, 1873. These were independent of the sittings devoted to a revision of the manuscript. In August, 1874, " Ruisdal " and" Steen" announced that they would endeavour to give a series of " direct" drawings as illustra¬tions to " Hafed's" communications, and they requested that for this purpose the medium, with three or four of his friends, should sit weekly. A number of pieces of cardboard, 9 and a half by 6 and a half inches in size, were procured, and were numbered and initialled by the members of the circle. Before the end of May, 1875, forty" direct" drawings were received on these cards, all of them directly con-nected with the Persian's story.
" Hafed, Prince of Persia: His Experiences in Earth-life and Spirit-life; being Spirit Communications received through Mr. David Duguid, the Glasgow Trance-Painting Medium, with an Appendix, containing Communications from the Spirit Artists, Ruisdal and Steen. Illustrated by facsimiles of forty-five Drawings and Writings, the Direct Work of the Spirits." Prom whatever point of view the volume may be regarded, it is the most remarkable work of its kind ever published in Great Britain. Within a few weeks of its publication a very unlooked for event happened, the discussion of which belongs to a later section of this chapter. It will now be worth while to devote a little attention to the general question of the nature and value of the evidence in support of the reality of Mr. Duguid's mediumship. It bas been lamented over and over again in recent years, how very small an amount of attention was given by trained or scientific investigators to phenomena alleged to occur in the presence of such men as D. D.
Home and W. Stainton-Moses. The absence of this is still more observable in the case of David Duguid. There were, however, plenty of commonsense, intelligent, and well-educated observers. A narrative of facts is given by Mr, H. Nisbet in the Introduction to "Hafed." From this narrative most of the statements made in the preceding paragraphs are taken. Several independent contern¬porary reports of the phenomena were also published in those early years. A full descriptive article by Mr. Benjamin Coleman appeared in The" Spiritual Magazine" for June, 1866, Dr. Wrn. Anderson, a medical man then residing in Glasgow, wrote a descrip¬tion of a visit to Mr. Duguid, which was published in " Human Nature" for November, 1868. On May 28th, 1870, a long article appeared in the" Medium and Daybreak" from the pen of Mr. James Burns, giving his own observations in detail. In the 'Christian Spiritualist" for November, 1874, George Sexton, LL. D., gives a circumstantial account of one of the special sittings for the production of" Direct Drawings." Much more recently, in the" British Journal of Photography" for May 26th, 1904, the Editor, Mr. J. Traill Taylor, gives a long report of a sitting he had with Mr. Duguid. This may be regarded as a scientific report. Nearly all the different physical phenomena usually associated with Spiritualism occurred at times in Mr. Duguid's presence. Move¬ments of objects without contact, both in light and in darkness, raps, perfumes, levitations, lights, the handling of burning coal, were more or less frequent. Ruisdal and Steen, however, kept these as much as possible in the background. They considered they interfered with the main work of the medium. light being left to show the progress being made at the easel. " The time occupied was one hour. When the light was turned up the painting was recognised as a coast scene on the Clyde. After this came the "direct" painting. The writer of the article proceeds to describe how the Medium, still in trance, -the gas being now turned up,-opened a box that was on the table, and took out a white paste-board card, the size of a small photographic carte. One of those present was indicated as the person to whom the small picture was to be presented when done. The Medium tore a small piece off one corner of the card and handed it to the person indicated. The card was then laid upon the table and the gas put out. After a short time the Medium gave the signal for lighting up ;-" And lo! the blank white card was filled with a miniature copy of the coast scene on the easel, only more finished in detail, having the addition of a steamer on the water. .. The piece torn out of the comer was fitted into the card again, and fitted it to a 'T '." The second Report, which we will sumrnarise, is one by a sub¬committee of the" Psychological Society of Edinburgh" on "The Mediumship of Mr. David Duguid." That Society included among its members, several who were then, or who afterwards became, distinguished :•-Dr. G. B. Clark (President), Sergeant Cox, Mr. William Crookes, F.R.S., even then Editor of the "Quarterly Journal of Science," and of the" Chemical News," and Mr. Alfred Russel Wallace." This was in 1873. The following is a very brief summary of the Report of the Sub-Committee, signed on its behalf by J. D, Morrison, M,A., Corresponding Secretary. with someone close by. Mr. Bowman explained that this was a " greeting to his spirit-friends." "Mr. Duguid then went to the easel, shifted the frame considerably higher, and then proceeded to the table, where he arranged about a dozen brushes, and about twenty different colours. Taking a pencil he returned to the easel, and began with great rapidity sketching his outlines on the cardboard. After a few minutes the gas was entirely put out. Listening, we heard the pencil running over the paper at a great rate in much the same way as we had seen as well as heard in the light. This movement of the pencil ceasing, we concluded that the sketching had been finished, and accordingly we lit the gas to make certain. We were not mistaken, for not only was the sketch entirely finished, but the brushing in of the background entered upon, so that what we took for bis cessation of work, was due to his standing quietly at the table, mixing his colours, and arranging his different combinations of tints. Noting, as nearly as possible, the colours on the palette before he began, we observed several new combinations of colours which most certainly were not only mixed but matched in the total darkness. We again turned off the gas, and heard the brushing go on in the total darkness, quite as well as in the light. . After a little we again lit the gas, and found the picture nearly finished. Mr. Duguid worked at it some minutes longer, when, looking at it attentively, he rather suddenly stopped. From the time he began sketching with the pencil, till the time he finished with the brush, thirty-three minutes only had expired." landscape, the execution of which two pictures, including the third one ¬found the next day sticking within the globe of the gas lustre -had only occupied about twenty seconds, being less than seven seconds to each. While pleading our own utter inability in any way to explain this seeming miracle, we desire to inform our investigating friends, tbat these little paintings, executed within seven seconds, if done by one spirit artist, or if done by three separate artists, twenty seconds (as to two of them), were thrown on the table with the painted sides uppermost, and quite wet from the brush. On comparing the (two) cards with the comers, which from the moment they were torn off, never left the hands of either of the ladies, each card was found to exactly and perfectly fit the corresponding corner belonging to itself, and not at all either card with either corner." "During the time we were sitting in total darkness, and while the lights were playing all over the room, we heard a subdued muscular voice, which, being recognised by Mr. 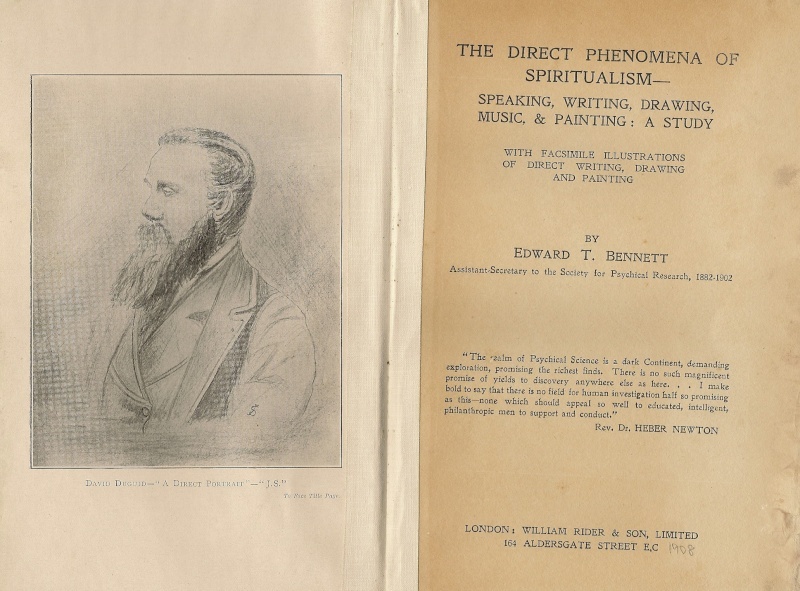 Bowman as a voice he had heard before, was asked the question, whether a conversation could be carried on, when we we were informed, in the direct 'spirit voice' that for want of sufficient power in the room no further manifestations could be given." * For fuller reports of these two seances the reader is referrecl to "The Spiritualist" newspaper, for April 1st and May 15th, 1873, from which the above extracts are taken. offered, and then Mr. Duguid usually went into trance, and gave an address. The meeting was closed by another hymn and a benediction. Mr. Garriock sent me a printed account of the circumstances of this manifestation, written by himself very shortly afterwards, from which the following is taken :- . • See" The Spiritual Record." Vol. i., p. 58. III-SOME EXAMPLES OF THE "DIRECT" PHENOMENA. In this section I propose to describe in detail a few cases of the " Direct" Phenomena which were manifested during the forty years of Mr. Duguid's experiences. The descriptions will be illustrated by,a number of facsimiles of Drawings and Writings which the kindness of many friends enables me to reproduce. I shall endeavour to make the selection as varied as possible, by taking typical examples of different kinds of manifestations. As an introduction it is necessary to return again to the first important trance-painting executed by Mr. Duguid. * See" The Spiritual Record." VoL i., pp. 287-8.
the engraving of the picture in" Cassell's Art Treasures Exhibitor," p. 301. See Illustrations Nos. 2 and 3. "Dear Mr. Burns, --J have sent off the direct drawing by post as I promised, and now I will give you some information connected with it. Mr. Henry Murray, Mr. Aitken, and myself, with Mr. Duguid, met last night." " This was done, and we found the card as now sent. I recognised the subject at once, as being that of raising a dead body to life on the banks of a river. Steen has introduced the two Brahmins that formed the subject of the little card picture. The two other figures are the Persian and Jesus of Nazareth. Observe also the dimly defined figure of the spirit belonging to the body lying in the river, hovering over the wife and child. " Steen said he had taken a painter's license in leaving out the spectators mentioned in the narrative, and given what he considered best. He had put in the images of "Krishna" and " Ganesa." He has got these names written on a slab in the foreground, below which is his own name." 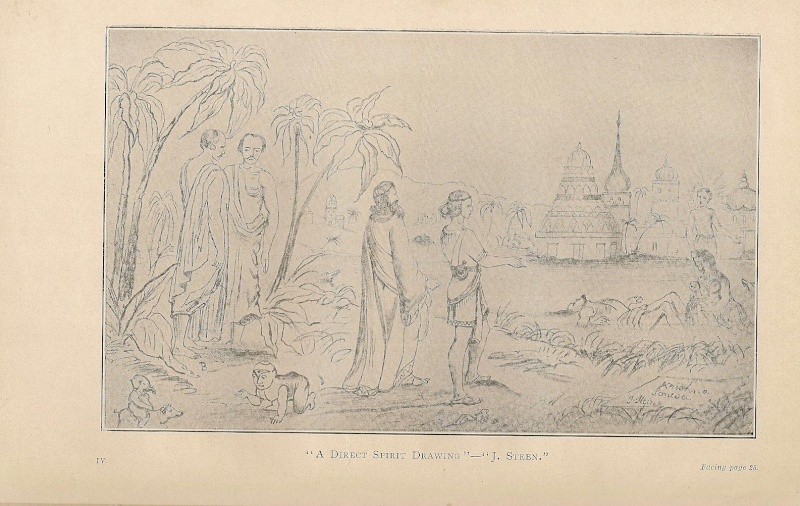 "A DIRECT SPIRIT DRAWING (Copy)." "Produced in complete darkness, in about four minutes, while the Medium, Mr. D. Duguid, was entranced at Glasgow, on Satur¬day evening, January 13th, 1872. Present, Mr. H. Nisbet, 169, Trongate, Glasgow; MI" H. Murray, and Mr. Aitken, who declare that the Drawing was the work of Spirits, no mortal hand having assisted." a corner off one of them, dropped the piece into the hands of Mr. Bowman. Laying the card on the table along with a pencil, he sat back and made the usual signal for darkness. The gas was ex¬tinguished. In about two minutes the signal was made to light up. It was then found that the card--which was identified by the fitting in of the corner piece-was inscribed with two Hebrew quotations from the Old Testament, two Greek quotations from the New Testament, and three Latin sentences. Some faint undefined rays surrounded the Hebrew words. In the margin were references in English to the Scripture quotations. In the left hand bottom corner was a word in strange characters, apparently a signature. "J. Steen" said it was the name " Hafed" in Persian. There were thus four, if not five languages on the card, besidcs the figures referring to chapter and verse of the texts. It was stated that no one present knew anything of Hebrew 01' Greek, and that but little could be made of the Latin sentences. Having received their model or pattern, arrangements were made for Mr. Duguid to undertake, in trance, the painting for the panel in the Hall. This was done in his own house. A sheet of paper, 7 by 3 and a half feet, was nailed up on the wall of the parlour, Several sittings were devoted to the work. Shortly before this trance-painting was finished, on going into the room one morning, an English translation of the three Latin sentences was found, written in pencil, almost close to the lower edge of the sheet of paper, about fifteen inches from the floor of the room. This was subsequently cut off, divided into short lines, gummed on to a card, and photographed. As far as the wording is concerned, the original "direct" pattern was exactly followed in the trance-painting. But the indefinite halo round the Hebrew words in the pattern was replaced by a more elaborate design, The word in strange characters was replaced by the word "Hafed," and in the opposite corner was written- "J. Steen, D. Duguid, Meds., 1872." texts, the words of both are correct. In the" direct" drawing, the Greek letter 71, which occurs three times, is written in a peculiar style. In the trance-painting it is written as usual. As to the accents, they are altogether omitted in the Hebrew, in both the "direct" and" trance" drawings. In the Greek, they are omitted in the" direct" drawing, but are included in the" trance" drawing, with substantial, but not absolute accuracy. It is practically certain that there was no one present who knew anything of Hebrew or Greek. The handwriting of the translation of the Latin sentences bears considerable similarity to the handwriting of the Latin in the " direct" drawing. POI' the description of the circumstances above described, under which the" direct" and "trance" drawings were obtained, Mr. Hay Nisbet is responsible." In reference to the peculiar style in which the Greek letter Eta is written, three times, in the "direct" drawing, a very curious point has arisen. Mrs. A. W; Verrall, of Cambridge, has, in response to my sending her photographs of the two writings, kindly given me some most interesting information. 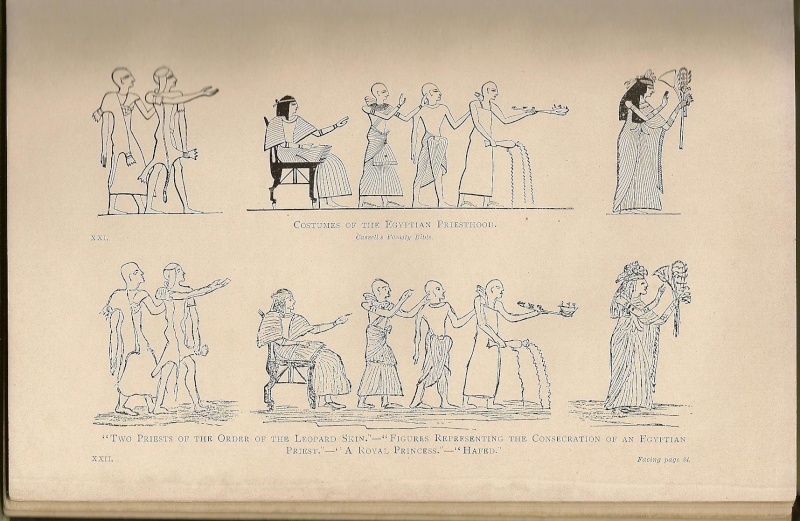 She encloses tracings of Greek Etas from a standard work, "Thompson's Palreography." The writer of this book speaks of the occurrence of a peculiar form of Eta, somewhat resembling Upsilon, which he says probably came first into use in the first century B.C., and of its being quite established at the beginning of the Christian era. This form of Eta which Thompson gives as in use in the first century is exactly like that on the" direct" writing. Mrs. Verrall adds :-" The Eta of 1700 should be our modern Eta," and concludes by saying;¬"The script therefore seems to be arch reo logically correct." We have therefore this very curious feature of the case brought out in an unmistakable manner. In" direct" writing, alleged to be produced under the control of an intelligence who lived in the first century of the Christian era, a certain Greek letter is three times (every time it occurs) written in a form then in use. In a subsequent copy of the same Greek passage, alleged to be produced under the control of an intelligence who lived in the seventeenth century, the same letter is written in a form then in use, and which form continues to the present time. The facsimiles of the photographs of the two writings _. Nos. 5 and 7--cIearly illustrate the point. * See" Hafed" pp. 565-6 . From 1875 - 1885, five volumes were privately printed by Mr. Wm. Oxley, of Manchester, under the title of "Angelic Revelations." Three of the volumes have pictorial frontispieces, the originals of which were "directly" drawn at Mr. Duguid's circle in Glasgow. Mr. Thos, Powers, of 124 Great Clowes Street, Broughton, Manchester, was intimately associated with Mr. Oxley in this work.The drawing above described is one of these three frontispieces. In a recent letter, Mr. Powers confirms the state¬ment of the conditions under which these drawings were produced. He says; "The plain paper was put into an envelope. The three gentlemen placed their fingers on the sealed envelope and turned off the gas. In three minutes the gas was turned on, the envelope cut open, and the drawing was found in its complete state." • This extract is taken from " The Spiritualist's Calendar for 1876 ; and Truthseeker's Guide to the Investigation of Modern Spiritualism," of which the Rev. F. W. Monck was Editor. Mr. Powers has kindly sent me the pictorial frontispiece from Vol. IlL, with permission to reproduce it-Illustration No.8. In doing so, he says :- "This is a symbolic representation of Angelic Love and Wisdom, combined. A Feminine Angel stands upon a Rock in front of a Cross, which rises high above her head. She wears a golden crown and a golden necklet, from which a jewelled cross is suspended. In her left hand she holds the flower-stem of a lily, on the tip of which is a fully developed flower. Her right index finger is raised, and points to the cross and crown above her head. This was drawn at Glasgow on October 10th, 1878, under the conditions named. These frontispieces and about twelve others were given as illustrative of the Teachings of the Volumes entitled "Angelic Revelations.'" Mr. Powers adds that he possesses the original "direct" drawings produced as described. Reference was made in the preceding section of this chapter (see ante, p. 15) to the production of small" direct" drawings and paintings at Mr. Duguid's seances. This was continued during a long series of years. Most of these card-pictures were given to visitors present at the seance at which they were executed. The number of such must bave amounted to many hundreds. Through the kindness of correspondents, I am able to give facsimiles of two, one of a pencil drawing, the other of a painting in oils, Both fac¬similes are taken from the" direct" cards themselves. Jas. Simpson, Mr. Mason (scribe), and Mrs. McQueen. Mr. Walker held a hat, and I held Duguid's hands with both mine. The pencil and card (without anything on it) were put into the hat, and in about fifteen minutes we lit up, and the picture was on the card." c, The picture on the card I enclose was produced at a seance at which Duguid was the medium. A bit was torn off from the card before the light was put out, and this bit I put in my pocket. In a short time on turning on the light, the picture (wet) was on the card, and the bit exactly fitted." The facsimiles show the exact size of the cards as well as of the pictures, and also the torn-off and re-fitted cornet' in the second one. The colouring of the latter is rather rough, but bold and effective. action of Messrs. Cassell & Co. The matter was quickly and arnic.ibly settled, without being brought into any Court. The first Edition of" Hafed" was withdrawn. Before the close of the same year -1876-a second Edition was issued, the offending plates having been expunged. No reference to the occurrence was made in the second edition, and no statement or explanation was issued. , medium,' so called, must be a common cheat, and I hope he will get what he deserves." So the commentators, editors, and correspondents alike, fell back upon what they thought to be the next most plausible theory-the" dishonesty of the spirits," as to which there was no more evidence than there was of the dishonesty of the" medium." I will quote a few of the comments made.
" 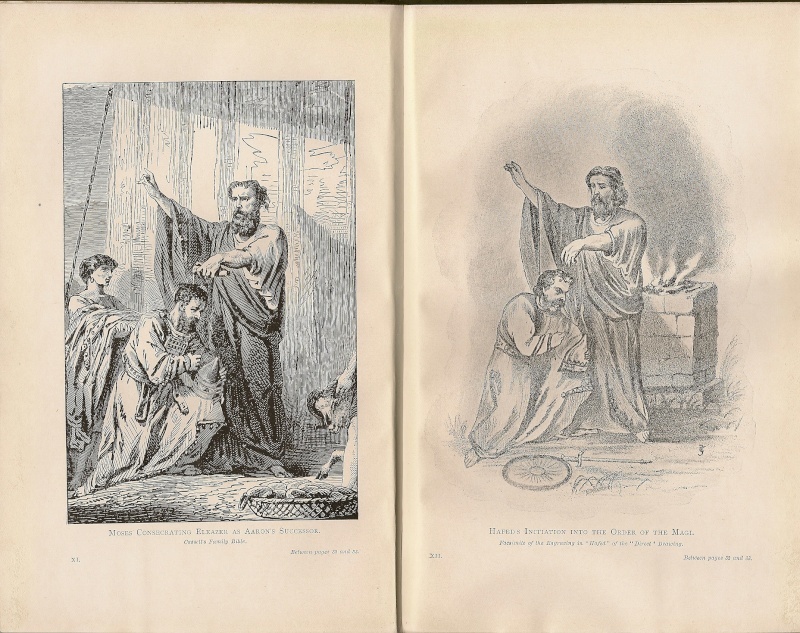 The circumstance that some of the pictures in I Hafed ' are more or less direct copies of some of the plates in 'Cassell's Family Bible,' was due to the deeds of the spirits, and not to the medium. '.' . The power connected with physical manifestations is frequently untruthful in the highest degree." "The wonderful and most useful phenomena of physical mediumship step in combined however with not a little untruth and deception, coming chiefly from the spirits themselves, and more rarely from the sensitives under their rule." " Many of the spirits who produce physical manifestations are inveterately untruthful. . . . Many are tricky and untrustworthy. Five¬sixths of the scrapes into which their human instruments fall, are probably due to the deeds of the spirits themselves. . . . Gradually the too frequent untruthfulness connected with the messages which accompany powerful and wonderful physical manifestations is becoming known." One redeeming comment comes from Mr. Benjamin Coleman, a man who had great experience in this class of phenomena. He remarks :-" It appears that Messrs. Cassell & Co. have stopped the sale of ' Hafed ' on the ground that some of the drawings in the work ... are copied from their' Illustrated Pamily Bible.' This, if true, may be taken as a most remarkable psychological fact." I will now give a brief statement of the substratum of fact upon which a mountain of invective, accusation, and innuendo was built up. The first edition of " Hafed" contained 24 full-page plates and one half-page illustration, drawn specially for the book. When the second edition appeared, it was found that eight of the full-page plates had been suppressed, and the half-page illustration had been substituted by another drawn specially for the purpose. I have, however, been unable to discover that Messrs. Cassell's complaint and interdict applied to more than three of the full-page plates, and to the half-page illustration. The whole matter rests on the alleged plagiarism of four plates. Through the kind permission of the present representatives of the firm of Cassell & Co., and of the present owners of the copyright of "Hafed," I am able to place before the reader facsimiles of the essential portions of the four illustrations in the" Family Bible," and also of the four "Hafed" illustrations, Par the first time, these four pairs of illustrations have been brought face to face. Par the first time, unless weary hours are spent in hunting out the illustrations in the two works, has either the spiritualist, or the general reader, had an opportunity of forming an opinion of his own, or of even judging approximately of the importance or insignificance of the alleged plagiarisms. nearest approach to facsimile in detail is what appears to represent a head-dress or sort of mitre in the left hand of Hafed and Eleazar respectively. Second Pair, Nos. 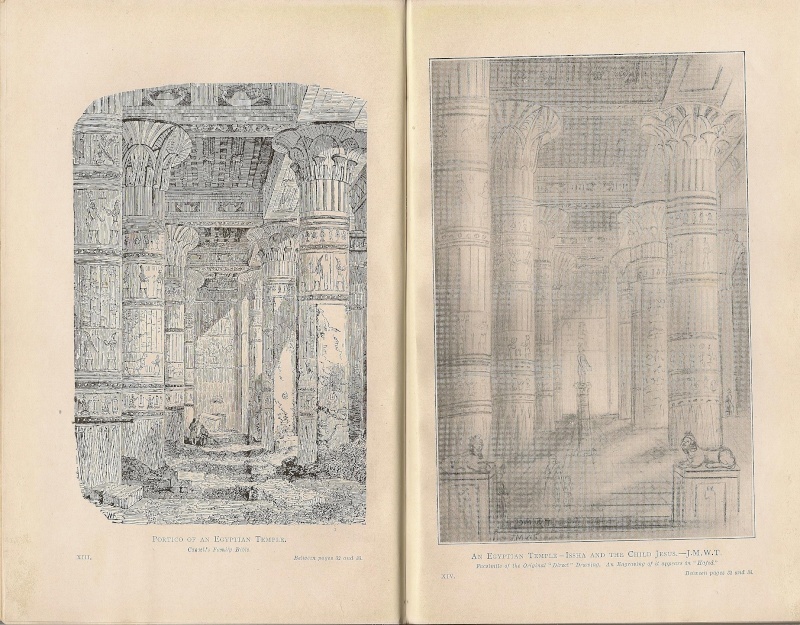 13 and 14.- The similarity is in the architecture only, But some of the architectural ornamentations, and some of the carved figures and hieroglyphics in the two plates, so nearly approach facsimile that the result is very striking. Third Pail', Nos. 15 and 16.- The attitude of the two dead figures is strikingly alike. But there the resemblance ends. Fourth Pair, Nos. 17 and IS.-The similarity of attitude is again the only remarkable feature. But that is too pronounced to be attributable to accidental coincidence. An attempt to explain these similarities is made later on (see Chapter VI.). I will now describe two more cases from the c, Family Bible" and c, Hafed," which do not appear to have been noticed hitherto, and which present somewhat different and peculiar features. 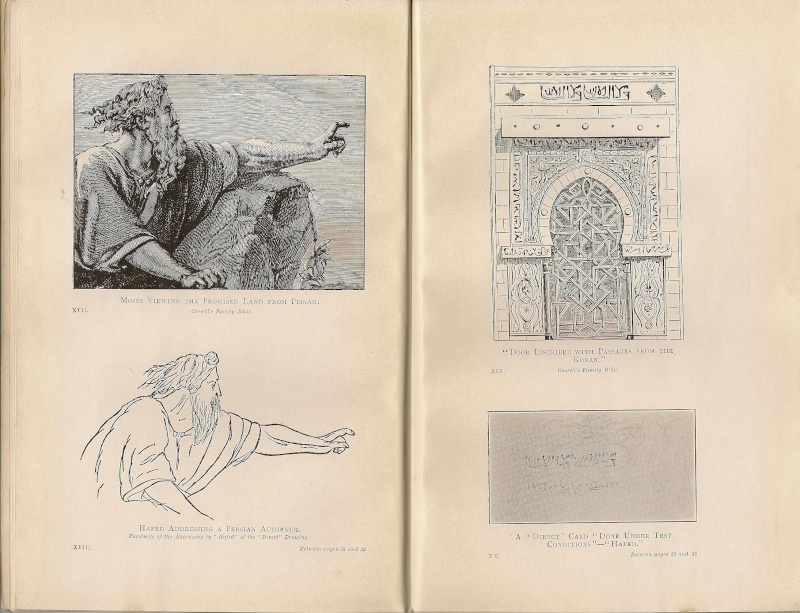 (1) Among the smaller illustrations in "Cassell's Family Bible" is one described as representing a Syrian Door and Door¬way, in cribed "with passages from the Koran" (p. 279). In " Hafed " (p. 562), in an Appendix written by Mr. Hay Nisbet, is a facsimile of a card which is thus described :-" Here is a card, done, under test conditions, on 13th Nov. 1872. I can say nothing more about it; but perhaps some learned reader may be able to give information regarding it." I have a photograph of this card taken from the original, but have never heard of any suggested interpretation. 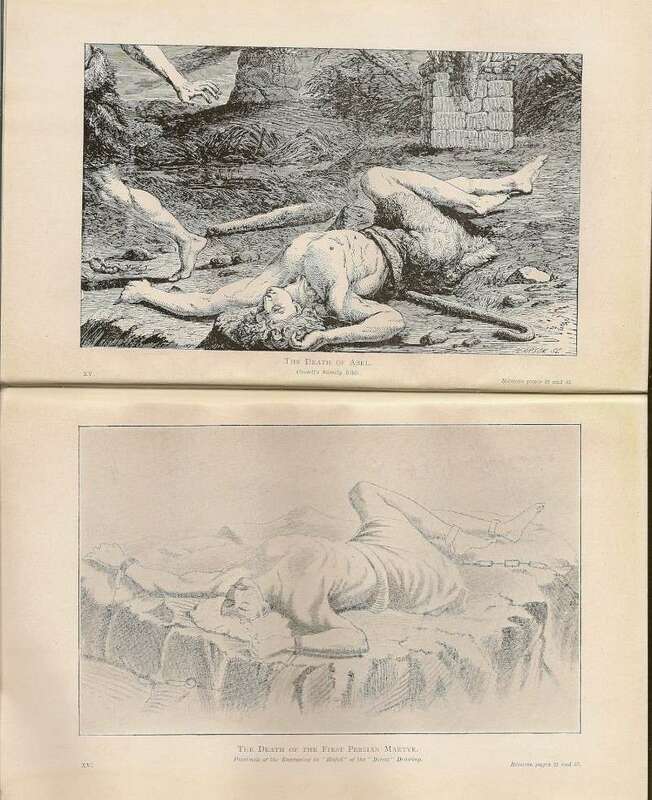 The two illustrations which follow, Nos. 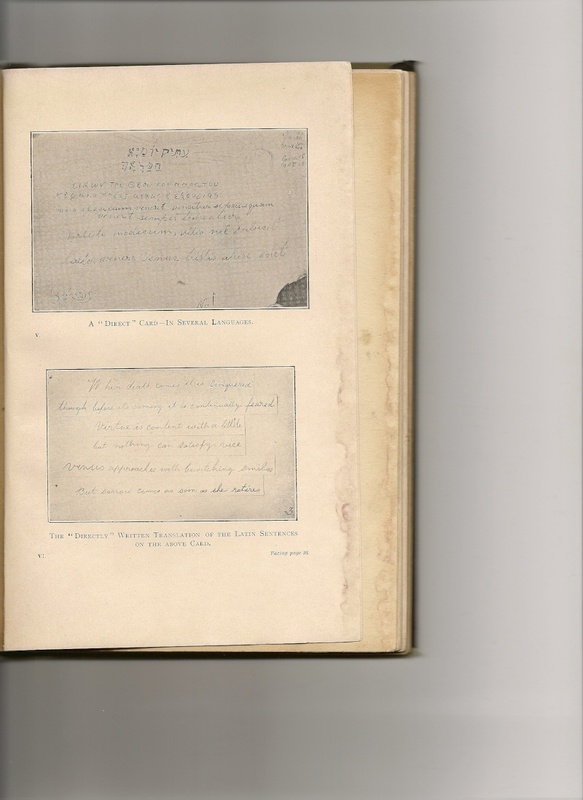 19 and 20, are facsimiles of the Syrian Door from" Cassell's Family Bible," and of the photograph of the original card. The reader will see on close examination that there is a striking resemblance between the large inscription above the doorway and the three inscriptions above and at the sides of the upper part of the door, and the two inscriptions on the card. 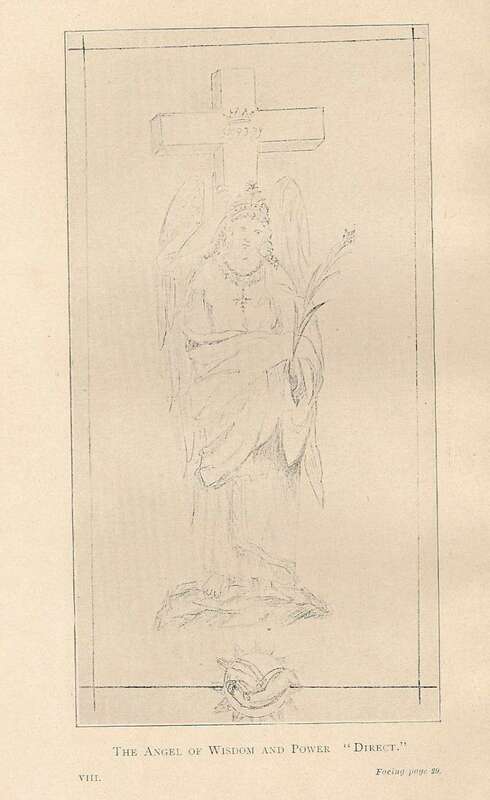 "The annexed picture [the four figures] representing the consecration of an Egyptian Priest, was given, along with two other drawings, on one of the large cards used for the direct ..illustrations of this volume. At a subsequent sitting we were told that the figure on the chair represented a priestess, one through whom the higher order of priests received the oracles. The figures represent three of these priests officiating at a consecration. The two figures [on the left] are priests of the lower order, that of the Leopard Skin. The entire skin of the animal was used for the garment. The duty of this class of priests was to keep everything belonging to the service of the temple clean and in proper condition. The other figure is that ofa royal princess. All these figures (Hermes informed us) were frequently engraved on monuments, and in hieroglyphic writings." The four figures of Cassell's central group are thus described :¬"Various Priests (1) seated, (2) adoring or praying, (3) saluting, (4) offering fire in a censer, and holy water in a vessel." The two figures to the left in Cassell's appear as part of another plate, and are described as " Priests in Leopard Skins." The female figure to the right, in Cassell's, is described as a Priestess and Mother of a Priest. Further comments on these two cases are made later on (see Chapter VI., pp. 60, 61).
. t Manners and Customs of the Ancient Egyptians. By Sir J. Gardner Wilkinson D.C.L., F.R.G.S. New Edition. Revised and corrected by Samuel Birch, F.L.D., l878. SUMMARY OF RESULTS, AND CONCLUSIONS. lished. A regular and harmonious progress may be traced. In this series of volumes the first group of phenomena which engaged our attention consisted of some of a purely physical character, those connected with Thought-transference 01' Telepathy. The reality of Telepathy-that is to say, the existence of a means by which definite thoughts pass from mind to mind independent of the organs of sense-vis, we consider, demonstrated. This truth is, in one sense, the foundation of our philosophy, and as we have seen, and shall see still more, is of vital assistance in the solution of many phenomena. Physical phenomena of various other kinds have also been less fully dealt with. Sufficient evidence has been adduced to form a strong prima facie case for further enquiry. * In the preceding pages a group has been under consideration consisting of phenomena partly physical and partly psychical in their character. It will be interesting to see, in endeavouring to explain these, what connecting links can be found with our previous enquiries. *See volumes I. and I l. of this series, and also a volume of the "Scientific Series" published by T. C. and E. C. Jack, under the title of" The Physical Phenomena of Spiritualism," Price 1 Shilling. net. the presence of Mr. D. D. Home and of the Rev. W. Stain ton-Moses. Mr. Myers' own personal experiences in phenomena of the " direct" kind seem to have been quite limited. He had, I believe, several sittings with Mrs. Everitt, but I have never seen any report of them. I have also heard a vague report of his having been present at Mr. Duguid's circle at Glasgow, on one or two occasions. But neither Mrs. Everitt nor Mr. Duguid seem to have produced much impression on his mind. It is a singular, and it might be called a suggestive and a regrettable fact, that in regard to two of the most celebrated "mediums" of last century, the records of alleged phenomena in con¬nection with them, received Mr. Myel'S' special study, only after they had departed this life :-Mr. D. D. Home and the Rev. W. Stain ton¬Moses. As to the first, Mr. Myers came to the conclusion that none of the charges of fraud bad any foundation in fact, and he counselled future students to treat the phenomena as if they were real. As to the second, he expressed his absolute conviction ofthe reality of the phenomena. It appears to me that if Mr. Myers had devoted similar study to even the records of the experiences of Mrs. Everitt, and of the Duguid circle, it is reasonable to believe that he would have come to similar conclusions. As it was, the phenomena the reality of which Mr. Myers became convinced included some cases of " direct" action. These, however, seem to have been almost entirely confined to " direct" writing and the "direct" voice. The student is referred to the paragraphs included in c, 926 A" in the Appendix to chapter ix. in Vol. II. of " Human Personality," pp. 505-554. *" Human Personality," Vol. II. p. 505.
different subdivisions are commented on by Mr. Myers at great length. The" direct " phenomena we have been considering find their place in it. We will, however, try to realise the picture he draws more definitely, by looking at it from a slightly different point of view.
"" Human Personality," Vol. II., p. 506.
for evil. The world is indebted to Mr. Myers for a formulation of this conception, by means of which comparative order has been evolved out of chaos, in regard to various classes of phenomena, previously scorned by some, and neglected by others. This brings us to a possible solution of some of the phenomena which have been described in the preceding pages. The reality of Telepathy, that is of the transferance of definite thoughts from the mind of one person to that of another, is here assumed to have been demonstrated. Assuming this, and also assuming that we have evidence of the existence of intelligences besides those present in the flesh, let us, as a provisional hypothesis, extend our idea of the action of Telepathy. Also as part of our provisional hypothesis let us consider it tenable, that an impression once made on the mind remains in some lasting form, even though entirely forgotten by the conscious memory. Let us take one step at a time. An intelligence calling itself by the name of Marcus Baker, professes to write automatically by the hand of an entranced "medium,"-David Duguid (see ante, p. 14). This intelligence desires to give evidence of his separate individuality, and of his identity. He describes himself as an artist, and offers to attain his object, by " controlling" the medium to reproduce one of his principal pictures. We can imagine that, forming an image of one of his pictures in his own mind,-as " Agent," in the phraseology of the Society for Psychical Research,-he endeavoured to impress the image on the mind of the medium as percipient. The result was that a" Thought-Transference" picture was produced. I submit that this may have been done in an analogous way to the numerous" Thought-Transference" drawings, produced by many "Agents" and "Percipients," as recorded by the Society fOI' Psychical Research. In the particular case above referred to, the picture thus produced was found to bear a very strong resemblance to a known painting by the Dutch artist, Ruisdal (ante, p, 14). The additional very curious incident of the presence in one picture, and the absence in the other, of some figures on the bridge, as bearing on the question of identity, does not come within the scope of the present enquiry. Let us look at another case of a somewhat different character, but similar to that described on page 14. The main object was for a certain visitor to obtain a trance-painting under con-ditions satisfactory to himself. This gentleman, well-known in art circles, had, of course, seen numbers of paintings. The" medium" is again David Duguid. Thought-transference may in this case be supposed to have heen brought into action in either one of two different ways. (1) The "control" may be imagined to have impressed the" medium " to perceive the image of one such picture which lay latent in the mind of the visitor; or (2) the <, control " may be imagined to have himself selected one from the images of pictures in the visitor's mind, and then to have impressed it on the mind of the" medium" for him to paint. When the painting was finished, the visitor remarked that he ought to know the picture, but could not remember where he had seen it. He subsequently found its facsimile at home among some pictures he had bought at lit sale. In a letter written by Mr. Hay Nisbet, under date of March 14th, 1876, and which appeared in the" Spiritualist" newspaper of March 24th of that year, the following sentence occurs: I, The spirit-artists have repeatedly mentioned that many of the little " direct" card paintings and drawings, which have been given away to visitors, were taken from impressions 0\1 the brain of the medium and other persons present." It is also recorded that the visitors sometimes recognised the pictures as scenes they were acquainted with. All this is most interesting as being earlier than the time when the idea of Thought- Transference or Telepathy took definite shape. 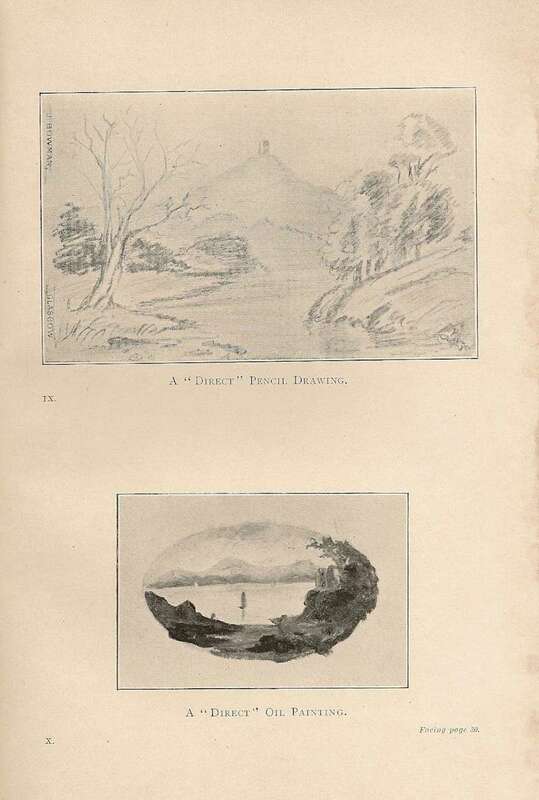 Mr. James Robertson also writes (see" Light" of Nov. 10th, 1894, p. 535): ,I Many of the scenes painted on the cartes are known to Mr. Duguid, and have probably been transferred from his mental atmosphere. On the other hand, however, sitters from America and Australia have had pictures of their own land which the medium had neither seen nor heard of." Applying our provisional hypothesis to direct phenomena, we may imagine that the intelligence which executed the "direct"
painting perceived the scene in the mind of the medium, or in that of the visitor, and either produced the painting at once himself or trans¬ferred it to the mind of the medium, and then in some way which we are at present unable to comprehend, caused its production. This leads us up to the drawings published in "Hafed," to the case which attracted public attention through the action of Messrs. Cassell & Co. (see ante pp. 32, 33). "Cassell's Family Bible" had been published shortly before the series of "Direct Drawings" specially intended to illustrate the text of " Hafed " was commenced. One or more members of the Duguid circle seem to have possessed a copy of this Bible, and Mr. Robertson, in the same article as that quoted above from" Light," says, that" MI'. Duguid admits that he had looked over the pictures in the Bible." Mr. Robertson also says-and this is confirmed by others-that" the tests adopted made it impossible that the medium's hands played any part in the production of the pict'ures. Yet here, apparently, was evidence that the pictures on his brain had influenced the production of the drawings." The reader is asked to turn back to pages 32•3, and to compare the four pairs of illustrations, in the same frame of mind as he would do if he was comparing four pairs of "originals" and " reproductions" of the Thought. Transference Drawings of the Society for Psychical Research, six years and more later. When reasonable consideration is given to all the circumstances of the case, they seem to afford strong grounds for believing that we have here a clue to the interpretation of the facts. The artistic intelligences who had offered to design the illustrations-there could not have been artistic results without an artistic intelligence some¬where-c-perceived pictures which the medium had seen, lying latent in his mind, some main features of which seemed to them appropriate for the purpose they h,ad in view. They resolved to make use of them, and to adopt certain features of them in designing their own illustrations. Hence the resemblance, more or less exact, in these four pairs of illustrations. From this point of view we have here a most interesting series of four cases, supporting the clauses of our provisional hypothesis-the continued existence of images once received into the mind, and the power of transferring such images to other minds. Support is also given to the view that Telepathy is a power possessed by both incarnate and discarnate intelligences.
" 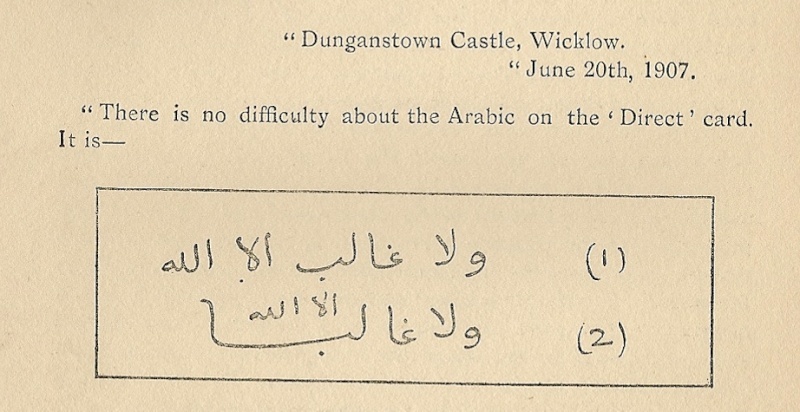 Dunganstown Castle, Wicklow. .
"There IS no difficulty about the Arabic on the' Direct' card. 'There is no conqueror but God.' You see it is the same phrase repeated. It is not from the Koran, but is the characteristic motto of the Moorish Kings of Granada (the Beni Nasr] and occurs on all their coins, and all over the Alhambra. But the writer of the , direct card' evidently had not the Alhambra n01' the Syrian Gate¬way in his mind, but' Cassell's Family Bible.' The engraver of the cut in that Bible, which you sent me, made a muddle of the lower line of inscription under the lintel, not knowing Arabic, and the 'direct card' exactly reproduces the engraver's blunders. The lower inscription is really identical with the larger upper inscrip¬tion, but, not being so big, the artist or engraver muddled it. I have not the slightest doubt that this card is the work of some¬one who had seen the' Family Bible.' I do not know how this bears upon the investigation, as I have no knowledge of the alleged , spirit' writings, but I am quite positive about the source of the card, whatever its chain of communication. Dr. Stanley Lane-Poole adds later :-" I have written the Arabic inscription both (1) in its natural form, and (2) in the arrangement adopted on the gateway. As you observe, the perpendicular inscriptions repeat the same formula. The final tail upwards is only a flourish to balance the figure and enclose the upper words." may have remained in her mind, it is conceivable, according to our provisional hypothesis that a record did exist there. When the question which was propounded came before the controllinq intelli¬gence, it is suggested by our hypothesis that it in some way perceived this" subliminal" record (as Mr. Myers would have called it), and utilised it for the purposes required. The physical phenomenon of the writing remains a fact. It is a fact which requires intelligence for its production. The circumstances under which this fact occurred appear to preclude the possibility, both on physical and mental grounds, of its having been produced by the intelligence of the" medium." If we can accept the theory of the existence of an invisible Cc agent," and also believe in "thought transference" thus extended, we can perceive an actual connection, a scientific connec¬tion, between these direct phenomena, and the simple experiments of the S.P.R. 25 years ago. Here then we have a glimpse of a possible explanation of these curious c, direct" phenomena. It is an explanation which eliminates two of the theories which have been suggested to account for them. The vulgar one of c, fraud," and the grotesque one of" evil" or "malicious" "spirits." We still remain entirely in the dark as to the physical means by which these perm a nent physical effects al-e produced. ofthis " direct" writing was made under the control of an alleged seventeenth century personage, as trance-writing, the ordinary form then in use of the same Greek letter was employed. (See ante p. 27). "Still another phenomenon. An artist of a certain celebrity wished to illustrate some of my publications. Now, in this I have my own ideas and am difficult to please. 'Veil, I succeeded in making him portray landscapes, such as those on Lake Leman, where he had never been, and he also claimed that I could make him draw things that he had never seen and give him the feeling of an ambient (or atmosphere) that he had never felt; briefly, that I used him as he used his pencil, that is to say, as a simple instrument."
." Some instances of Subconscious Creative Imagination." By Miss Frank Miller, journal oj the American Society for Psychical Research, June, 1<)07•"
lower right-hand corner; and in the left-hand corner there is a hieroglyphic, which is stated to be the name" Hafed," as if to imply that he was the artist of the original "direct" design. But this hieroglyphic has not yet been deciphered, or identified with any ancient language. The above remarks are also applicable, though not quite so definitely, to some cases of " direct" writing, such as some of those obtained in the presence of Mrs. Everitt. What is most needed now, in this branch of enquiry, is a multiplication of these" direct" phenomena. In the first place, that the fact of their reality may be still further established, and secondly, that some idea may be gained as to the means by which they are produced, as to which we are at present absolutely in the dark. The two great requisites in an investigation of this kind are the ability to perceive and to recognise facts, and "The scientific use of the imagination." There is here a boundless field for fascinating experiment and research. Work undertaken with an open mind, and in a scientific spirit, and with an absence of an a priori assumption that" fraud" is the only possible, or even the most probable explanation, is sure to be rewarded. Of course it is possible that" fraud " may be met with in everything human, and it is needful to guard against it, but it is time that gratuitous and preconceived suspicion of its existence should be discarded as inconsistent both with commonsense and science. Are heard across the Voices of the dark." There is a lot more material on David Duguid which I will put up on here over time. Much of the first half of the chapter seems to be extracted from Bennett's book however the last part refers to Duguids work as a Photographic Medium. All was well and marvellous in the extreme until after the appearance of Hafed, Prince of Persia. His influence brought about a striking change in the medium. He appeared awe-struck and bent forward with hands clasped in the attitude of the deepest reverence. In forty-six sittings Nisbet, the publisher, took down the amazing story of a warrior prince of 1900 years ago who fought against an invading Arabian army, was later admitted to the order of the Magi, and ultimately rose to the office of the Arch Magus. He described the creeds and social life of ancient Persia, Tyre, Greece, Egypt, Judaea, Babylon, and many other long-perished civilizations, which he studied in his travels. The climax of his story was reached when he revealed that he conducted the expedition of the Three Wise Men to Judaea to the cradle of Jesus. He was summoned by his guardian spirit to go on the journey with two brother Magi and take rich gifts to the Babe. He described the youthful years of Jesus which were not chronicled in the Gospels, his travels with Him in Persia, India, and many other countries and the miracles which the young child performed. After the martyrdom of Jesus he became a Christian himself, met Paul in Athens, preached the gospel in Venice and Alexandria, and finally perished at the age of a hundred years in the arena at Rome. The story, which proved to be a very good historical romance, was published in 1876 with illustrations of forty-five facsimile drawings and writings done by the spirit artists Ruisdale and Steen. The spirit artists apparently had no respect for copyright. Arising from this, trouble arose which necessitated the withdrawal of the first edition of this amazing book. Instead of producing masterpieces as of old, Ruisdale and van Steen stooped to "lifting" illustrations from Cassell's Family Bible. 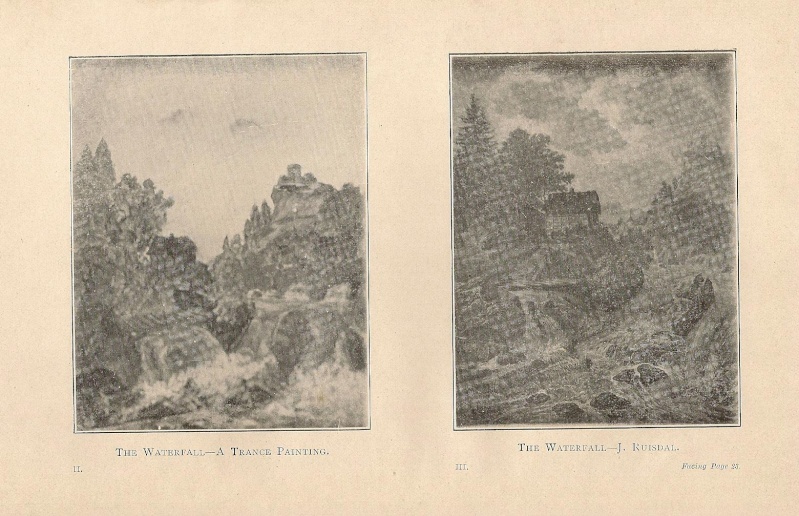 Three full page and one half-page plates were found to be unquestionably identical, though with some elaboration. For instance, a ruined navel in the Family Bible appears in a restored condition in the book. Four more plates gave rise to suspicion and were expunged from the second edition. The suspicion was justified. Mr. E. T. Bennett, who was Assistant Secretary to the Society for Psychical Research, submitted an inscription of an Arabic doorway which came in direct writing, i.e., while the medium was held by the hand, to the expert examination of Mr. Stanley Lane-Pool. He found the text to read: "There is no conqueror but God," the characteristic motto of the Moorish Kings of Granada which occurs on all their coins and all over the Alhambra. "But the writer of the direct card evidently had not the Alhambra, nor the Syrian Gateway in his mind, but Cassell's Family Bible. The engraver of the cut in the Bible, which you sent me," he wrote to Mr. Bennett, "made a muddle of the lower line of inscription under the lintel, not knowing Arabic, and the direct card exactly reproduces the engraver's blunders." Those who would hastily conclude that Duguid exposed himself to a charge of fraud would show no understanding of the psychological complexities of these phenomena. The mind of Duguid, with his retentive subconscious memory, may have had a lot to do with all these sketches and writings. His hands certainly did not. This was exactly the line of defence taken by the "controls" when reproached and pressed for an explanation. They said that they took what they found in the medium's mind. Wild and fantastic as the apology appears, it was borne out by other queer happenings. Visitors to David Duguid sometimes recognized in the "direct" paintings produced in their presence scenes which they were acquainted with in America and Australia and which the medium certainly could not have seen. Apparently, therefore, their memory, in some subtle manner, was also tapped. Another puzzle of a possible similar explanation was furnished by a photographic demonstration. In the presence of sitters, David Duguid often exposed plates trusting to obtain supernormal markings or pictures. On several occasions a beautiful portrait was found on the plate of a Priestess who, according to the impression given to the medium, had been dedicated to the Temple of Venus in Cyprus. The enthusiasm for the charming lady, however, abated somewhat when Mme. Isabel de Steiger, F.T.S., discovered that the photograph was a copy of a German picture "Night", a print of which was in the possession of Mr. J. W. Brodie Innes, an Edinburgh solicitor. It is not at all impossible to conceive that in faking a spirit photograph from a foreign painting, Mr. Duguid should have the misfortune of selecting the very picture of which a print existed in Edinburgh. But a claim has been made for another solution. Experiences with other mediums render it probable that somehow an access can be made to the buried store of memories. By a process totally unknown to us they become occasionally exteriorized on the sensitive plate. "The psychic figures behaved badly. Some were in focus, others not so; some were lighted from the right, while the sitter was so from the left; some were comely, others not so; some monopolized the major portion of the plate, quite obliterating the material sitters; others were as if an atrociously badly vignetted portrait, or one cut oval out of a photograph by a can-opener, or equally badly clipped out, were held up behind the sitter. But here is the point - not one of these figures which came out so strongly in the negative was visible in any form or shape to me during the time of exposure in the camera, and I vouch in the strongest manner for the fact that no one whatever had an opportunity of tampering with any plate anterior to its being placed in the dark slide or immediately preceding development. Pictorially they were vile, but how came they there?" Fraud and genuine phenomena march in a queer procession through the lifetime of many a famous medium. Duguid was no exception. In 1905 at the age of seventy-three, after nearly 2,000 seances, he was caught in deliberate fraud in Manchester. He brought the spirit paintings ready-made to the seance-room and attempted to exchange them for the blank cards which the sitters provided. On being forcibly searched, the original cards were discovered in his trousers. His friends were stunned by the exposure. They offered the explanation that Duguid's powers, as is often the case, must have lapsed, and, prompted by vanity, he made a childish attempt to provide the phenomena the sitters desired. The defence has a claim on our consideration. The psycho-physiological side of these problems is far too complex to pass a precipitate judgment. The qualification for mediumship is not stem morality but some constitutional or mental aptitude which escapes us in ordinary life, as there is no use for it. Rising from a lowly position and held up to admiration, mediums are inclined to lose their balance and do things incompatible with judgment or sanity. By supplanting the genuine with the spurious they may save much bodily discomfort and drain on their vitality. It is the line of least resistance. The majority of their sitters are miracle-mongers. The tendency to satisfy them with the least exertion is difficult to resist. This is now so well known that in the view of Dr. Gustave Geley, a famous French researcher, there is reason for severity in another direction. Bluntly put "When a medium tricks, the experimenter is responsible."